Colorado Auction Company. Colorado Real Estate Auctions. Certified Auctioneers. A Colorado Auction Company with Certified Auctioneers who know Colorado and Rocky Mountain Auctions. Certified Auctioneers, Innovative Technologies. Rocky Mountain Estate Brokers Inc. Our Auctioneers conduct successful Auctions in Denver, Boulder, Fort Collins, Greeley and at our Eaton Auction Center in Eaton, Colorado. See our upcoming auctions at www.whitleyauction.com or directly below. Dr. Astle purchased this property in the 1960’s. He and his wife raised their family here, in this little slice of heaven, minutes from old town Fort Collins, CO. Over the years, he made numerous improvements to the property. This property consists of five acres that are just outside the Fort Collins city limits in Larimer County Colorado that are zoned FA farming. A 1/8 share of Pleasant Valley Ditch Company irrigation water is also included in the sale. The main residence has been updated numerous times. One of the first things you notice about it is the large, enclosed wrap-around porch. It features a massive kitchen with new cabinets, beautiful hardwood floors and a commercial grade cook top. A quaint breakfast nook with windows overlooking the farm is right off the kitchen. The rest of the large main floor has brand new carpet and includes a large dining area, living room with fireplace and even a wall safe. A study/TV room is also on the main floor as is a ¾ bath. A massive oak curving staircase leads to the upper floor. This staircase was originally in the historic Stover Mansion in Fort Collins. Upon reaching the upper floor, you will be greeted by large, west facing windows. This comfortable sitting area includes built in cabinetry and large a window seat with storage. The upper floor includes three unique bedrooms that all have large windows. There is also a full bathroom on this level. There is also a full-unfinished basement under the original part of this home with tons of storage space. In 1986, Dr. Astle contracted for an addition on the original home so he could move his dental practice there. This addition was designed and planned for by an architect. It adds serious value to this property. This addition can be put to use and make you money in many ways. While you can enter it through the home’s kitchen, it also has its own entrance with wheelchair ramp. We believe the entire addition is ADA accessible. The main floor of the addition is where Dr. Astle ran his dental practice. It consists of a large reception/waiting area, two dental operatories with plumbing, a large lab area, a darkroom and one bathroom. The first things you will notice about the basement of the addition are the large windows that give you the feeling you are not in a basement. It features two bedrooms, a kitchen, a living room, a full bath and a laundry/utility room. There is also a direct entrance to the basement under the main house so the entire basement level is connected. The house and attached office are an impressive structure but we are just beginning to see this property. Dr. Astle also had a wonderful 34’x36’ two-story garage/workshop built near the home. It built it with the quality of a high-end home. The main floor includes three overhead doors and two walk-through doors. The concrete floor is heated by in-floor hot water heat, as is the entire upper level. A ¾ bath on the main floor allows you to clean up after a fun day on the farm. There is hot and cold water plumbed to one of the exterior walls if you desire to have a wash rack for animals. There is also natural gas plumbed to an outdoor concrete pad so you can connect an outdoor barbeque grill. The upstairs is insulated, but unfinished, allowing you to create whatever you want in that space. The large windows give you spectacular views of your farm. One of the highlights of this property is the historic red barn. Not many of these barns, that are over 100 years old, survive in Larimer County. The barn is in great shape for its age. Its main floor is 48’x48’ and includes several stalls, grain bins and a workshop. There is a large hayloft on the second level. There is also a cellar under the workshop if you know where to look for the hidden entrance. A nice set of corrals attaches to several sides of the barn. Whether you want horses, cattle, bunnies or goats, you will love the flexibility and charm the barn and corrals add to the property. This property is cross-fenced with three separate pastures or fields. Dr. Astle had an extensive well and sprinkler system installed with which to irrigate the property. He grew alfalfa for many years and was able to get several cuttings every year. The included irrigation water rights truly help bring this property to life every year. When you attend the property preview, you will notice the abundance of trees on the property. A cottonwood tree, that many people believe is several hundred years old, grows on the eastern edge of the property. When you own this property, you can raise anything from horses to rabbits. You can grow hay or anything else in the warm soil. The possibilities for this property are only limited by your imagination. The Astle Farm is minutes from Old Town Fort Collins and includes many of the amenities people living in the city enjoy. It has natural gas and City of Fort Collins electric, water and sewer service. The bathroom in the garage is serviced by a septic system. While the property includes irrigation water, Dr. Astle also planned ahead and had several freeze-proof water hydrants installed around the property. Numerous deciduous and evergreen trees surround the property. If you have been looking for the country life but did not want to leave the conveniences afforded by the City of Fort Collins, then this property is for you. Properties like this, this close to Fort Collins are rare. They seldom are offered for sale and stay in the same family for decades. This is the one opportunity you will have to purchase this property. Honestly consider the total value of a property such as this. Imagine what it would cost to replace the land so close to Fort Collins, the large home, the massive two-story garage, the historic barn, the corrals, the water rights, the irrigation system, all the trees, the public utilities and more. You will have one opportunity to purchase this property for your best bid on November 19, 2011. If you truly desire to acquire this property, do your homework and determine what this property is truly worth to you. Come prepared to place your very best bid as this is likely a once in a lifetime opportunity. Only one person will win at the Auction. Make your plans so you know you gave it your best shot. Good Luck! - 5 Larimer County, Colorado Acres zoned FA. - Large home with offices. - High-end shop/garage with unfinished 2nd floor. - Historic barn with hay loft. - Rare gentleman's horse farm. 5± Acres, Large Home With Offices, Shop, Barn, Water Rights & MORE! Public Auction Starts At 10:10 AM With Personal Property. Real Estate Sells At: 1:10 PM. See separate personal property Auction page. From College Avenue & Mulberry Street in Fort, Collins, Colorado go west on Mulberry Street to Overland Trail. Then go north on Overland Trail to 218 South Overland Trail. Do not enter the property prior to the Auction preview dates. There is a caretaker and security systems. Trespassers will be prosecuted. We have been hired by The J R Astle Trust to sell his entire remaining estate including this rare Fort Collins property. Dr. Astle was well known in the Fort Collins community and was extremely active in everything from the Elks to Fort Collins Little League. He purchased this historic Larimer County Property in the 1960’s and raised his family here on this Gentleman’s farm minutes from Old Town Fort Collins. There are few properties like this and even fewer are ever sold. Attend the Real Estate Auction Tours and come prepared to place you best bid. Real Estate Auction Tours & Previews. This Auction features online bidding. Bid from anywhere! $25,000 deposit and signed documents required to bid on Real Estate online. Click here to register to preview & bid online now! Real Estate Sells At 1:10 PMPersonal Property Sells To The Highest Bidder! See separate Personal Property Auction Web Page. Dr. Astle purchased this property in the 1960’s. He and his wife raised their family here, in this little slice of heaven, minutes from old town Fort Collins, CO. Over the years, he made numerous improvements to the property. This property consists of fiver acres that are just outside the Fort Collins city limits in Larimer County Colorado that are zoned FA farming. A 1/8 share of Pleasant Valley Ditch Company irrigation water is also included in the sale. Buying real estate at Auction is fun, fair and easy. All potential buyers are urged to attend the property tours and inspect the property. A Property Information Package containing the contract to buy and sell, a sample title insurance commitment, property disclosure and other documents will be available at the property tours or it may be downloaded at www.rmebrealty.com. It will be continually updated until the day of the Auction. The property sells with no contingencies for financing, inspections of any kind or anything else so arrange your financing now. If you desire to have any inspections or an appraisal completed, at your cost, we will assist you in any way we can. Make your inspections now and get ready to place your best bid. $25,000 in cash or a certified or cashier’s check, made payable to you, is required to receive a bidder’s number and to bid at the Auction. The successful bidder’s money shall be retained as a non-refundable deposit with the balance to be paid on closing in 30 days or less. All other bidder’s deposits will be immediately returned to them at the conclusion of the Auction. A standard 10% buyer’s premium applies to this sale. (10% shall be added to the high bid price to determine the contract price) Seller will convey the property by Special Warranty Deed free of all liens and encumbrances. Property taxes and utilities will be prorated to the day of closing. Full terms will be available in the Bidder Information Packet, at the Auction and the preview. All announcements Auction day take precedence over any other. The Trustee’s intention is to sell this property to the highest and best bidder on Auction Day but the Trustee reserves the right to confirm the high bid. See you there! This property sells As Is-Where Is with no guarantees or warranties of any kind. All information contained here was derived from reliable sources believed correct, but is not guaranteed. Buyer should verify all descriptions, condition reports, square footage, property boundaries, years of construction and anything else that may determine the value of this property. Buyers shall rely entirely on their own judgment and inspection. Announcements from the Auction Block take precedence over any previously printed material or any other oral statements made. RMEB Realty LLC, Robert Lee Johnson Broker, is handling all aspects of this transaction and has prepared and approved all advertising and marketing materials. Contact Bob at: 970-454-1010. This Auction features online bidding. Call us for your Auction! We will turn property into cold, hard cash in 30 days. Let us present your property to the WORLD so you get true market value! Colorado Auction Company RMEB Inc. is licensed, bonded and insured to conduct auctions in Denver, Fort Collins, Boulder, Greeley, Cheyenne, Loveland, Longmont, Estes Park and other cities and towns throughout Colorado, Wyoming and the Rocky Mountain Region. We can auction and sell your personal property or real estate throughout North America through our partnerships with US Auction Group. If you are interested in real estate auctions or sales please visit our sister website at http://www.rmebrealty.com/ to find out more information about upcoming real estate auctions and real estate sales. Our large Eaton Auction Center serves as a massive Auction House if an on-site auction is not right for you. Our Auctioneers will professionally conduct your auction or liquidation at your location or ours. Onsite Auctions are one of our Specialties! Auctioneers for RMEB look for another bid at a Colorado Auction. David P. Whitley CAI CES lead auctioneer asks for another bid. RMEB Inc. Whitley Auction. 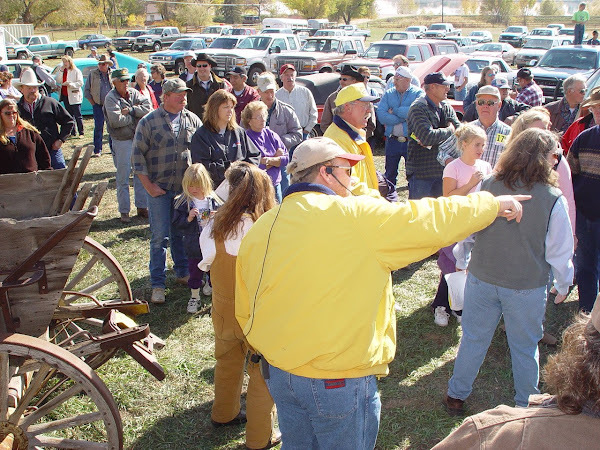 Colorado Auctions and Auctioneers. RMEB Realty LLC. Colorado Real Estate Auctions.